People with disabilities in wheelchairs. Legs disabled people in wheelchairs. MOSCOW, RUSSIA - MARCH 13, 2015: Group of people with disabilities in wheelchairs at the stadium during a charity show MOTOTERAPIA. 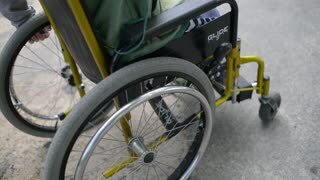 Wheels of special wheelchairs for the disabled. MOSCOW, RUSSIA - MARCH 13, 2015: a Lot of people with disabilities in wheelchairs at the stadium during a charity show MOTOTERAPIA. in special hangar, a young disabled man learns to ride a horse with close supervision teacher, hippotherapy. man has artificial limb instead of his right leg. rehabilitation of disabled with animals. aero, top view, winter, disabled man stands near black horse on snowy field. he has prosthesis instead of his right leg. he learns to ride horse, hippotherapy. rehabilitation of disabled with animals. a young disabled man jockey leads out of stable a black thoroughbred horse. man has a prosthesis instead of his right leg. hippotherapy. 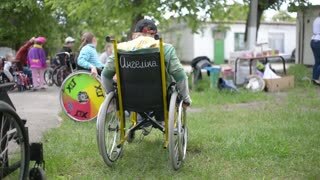 concept of rehabilitation of the disabled with animals. close-up, male rider, disabled person, without leg, help to put prosthesis, artificial leg in stirrups. man learns to ride horse, hippotherapy. concept of rehabilitation of disabled with animals. close-up, artificial leg, limb in stirrups. male rider, disabled person, without leg, learns to ride horse, hippotherapy. concept of rehabilitation of disabled with animals.